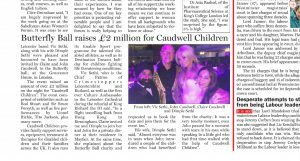 LEICESTER BASED BUSINESSMAN VIC SETHI SUPPORTS CAUDWELL CHILDREN AT THE ANNUAL BUTTERFLY BALL. With live performances by the likes of Lionel Richie and Tito Jackson and with an array of celebrities including Rod Stewart, Aston Merrygold, Rachel Stevens, Mark Wright, Penny Lancaster, Sir Bruce Forsyth and many more, the glamorous Butterfly Ball at Grosvenor House in London was the place to be. Along with his wife Dimple Sethi, Vic was pleased and honoured to have been invited by Claire and John Caudwell to the prestigious event. The successful event raised a staggering amount of over £2 million on the night. “In a flight travelling back from Hong Kong to Birmingham, Claire invited me and Dimple to join her and John for a private dinner at their residence in Mayfair and at the same time she explained to me about the Butterfly ball charity and requested us to book the date and join them for the event too,” shares Vic. Caudwell Children was setup by John Caudwell who has joined Giving Pledge, a global movement spearheaded by Bill Gates and Warren Buffet to bring the world’s most influential philanthropists together to help improve the lives of others. John is the former Chief Executive of the Caudwell Group (including high street retailer Phones 4u). He is one of Britain’s most influential entrepreneurs, as well as one of the country’s biggest charity fundraisers. He grew his business organically from a one man start up in 1987 to 10,000 people in 2006, from just a few thousand pounds turnover to over £2 billion. In September 2006 he sold the business for the biggest single cash out in UK history, £1.46 billion. One of the most important ventures in John’s life is ‘Caudwell Children’, a charity that he set up in March 2000. To date Caudwell Children has donated over £14 million to thousands of children with over 500 different medical conditions. The Charity is committed to changing the lives of disabled children by providing individual donations of specialist equipment, treatment and therapy, as well as its annual Destination Dreams holiday for families coping with a child’s terminal illness. Since its inception, the charity has doubled every pound raised, which has been achieved through supplier partnerships, meaning that every pound donated works even harder. More recently, John has agreed to become the principal benefactor for the War Memorial in commemoration of the Bomber Command. This is to be erected in Hyde Park. John has a very serious intent that his money and time should be used for the benefit of much less fortunate people. John lives in Staffordshire with his partner Claire and their son, Jacobi, and has four other children, the eldest being 31. He spends most of his time on his charity, his new business ventures, skiing, cycling and spending time with his family. Caudwell Children provide family support services, equipment, treatment & therapies for disabled children and their families across the UK. It also runs its Enable Sport programme for talented disabled athletes and its Destination Dreams holiday for children fighting life threatening conditions. Passionate, positive and practical, the charity is to improve the lives of the estimated 770,000 disabled children living in the UK, starting with the 400,000 living in or on the margins of poverty. Vic is a businessman based in Leicester, who grew up in Kuwait and came to the UK in 1990 during the invasion of Kuwait by Iraq. He and his brother run various family organisations including Anand International, Daewoo International (Europe), etc. Vic supports various charities and trusts around the world. He has sat on the board of various organisations like The Prince’s Trust, Crimestoppers, GNG Football Club, University of Leicester, Monty Panesar Foundation and many more. Vic Sethi is also listed in the “Most Influential People in Leicester” by Leicester Mercury and is the Chief Patron of Crimestoppers Leicestershire & Rutland. He has been appointed as the first ever Culture Ambassador to the Leicester Cathedral during the reburial of King Richard the III. Caudwell Children provide family support services, equipment, treatment & therapies for disabled children and their families across the UK. It also runs its Enable Sport programme for talented disabled athletes and its Destination Dreams holiday for children fighting life threatening conditions.